The ghost of the girl who has come to be known as "Resurrection Mary" or Bloody Mary Smith is one of the most famous ghost stories and urban legends (which you can also find in our forum here under Urband legends in the Curiosity Corner) of Haunted Chicagoland. She is believed to have been killed along Archer Avenue (near the cemetery) after leaving a funeral wake of her lover, Mother brother, or father, no ones quite sure, one cold rainy night. She was buried with no funeral mass or last words in Resurrection Cemetery. Bloody Mary tours the highway always hitch-hiking, dressed in black and has spent the last 90 years traveling the Haunted Chicago roadways and asking haunted truck drivers and lone people to drop her off at the cemetery gates. Only to disappear before their eyes. Another ghost just as well known is running Andrew Holcomb, he appears as a boy around the ages of 12- 17 years of age. He is said to run in front of passing cars and is struck. With a loud thud and impact is felt against the car or truck. People tell of the horrid sound and the blood on the windshield. When the hapless driver gets out to investigate he is not there, the boy is no where to be found. But the sight the sound of his body hitting the traveling drivers will haunts the driver their entire life. As they look around the road the only visible thing they see is the haunted cemetery gates. Andrew was said to be at the cemetery one dark night and something scared him. Frightened he bolted out and was struck and instantly killed. Many say they witness this every night for the past 12 years. Then there here is also the stranger ghost story of Caroline. Caroline was a southerner and moved her with her family and hated the chill and cold. They said she was also very afraid of the dark and buried with many candles and matches. On dark moonless nights a single candle flame is said to be seen moving through out the cemetery. Others tell of Caroline being a mournful crying ghost on EVP's. And of her are heard to say I'm caroline." and" It's a lonely cold chill." 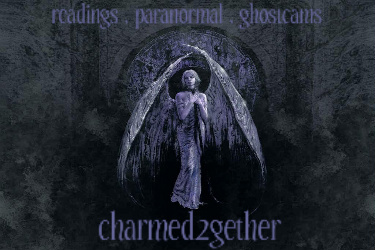 A stranger story about Caroline's ghost tells of how she has been seen in the daylight summer hours sunbathing atop her grave wearing a bathing suit laying on a large beach towel.. 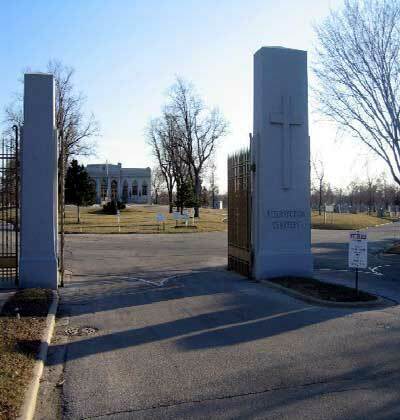 This cemetery is home to many a well known ghost story. It's the story of Thomas A. Milners and also haunted by his sister Marlene Milners Straub, She appears as a a young Blonde girl 24- 28 yrs of age with a thick accent, They say they were both killed when car ran them down t in 1959 while going home from family burial. They say both ghost are seen on the side of the road hand in hand and covered with blood. They say you can see steam coming off them in the cold night air. When you stop to see if you can help them the young girl looks at you and says.. in a thick polish accent " No I'm dead and waiting now only for the Good Lord!" then they just disappear. Thomas has been known to visit with others at funerals in this Cemetery. Often showing up even asking if he can help be a pallbearer. One story related to us was that he showed up at a families memorial funeral service and jumped into the grave at the end and disappeared. A un dead vampire is said to be buried here with all his vast treasure. Locals say he was just to old, this vampire gave up on being undead. One tale tells he still can be heard scratching from deep in the earth or his mumbled cries heard as the Sun sets. His Vampire Bride is said to be buried here to but she is now just a ghost and her body searches for her lost head. A old story tells that she was destroyed and beheaded and her head was buried in another spot far from her body. the body can bee seen roaming the cemetery and her head can be heard screaming" Please, Please, help me, help me!" Also the ghost of a young woman dark haired woman with green eyes called Rita Mae Taylor is said to haunt the central part of this graveyard. Often they say she tells you that something is wrong with this particular grave please come and investigate she's frightened. She tells you her name is Rita Mae Taylor and that she is not crazy....then pulls you by your hand to come investigate. Many when reading the tomb stone as they investigate the grave say she says" Well it's wrong just not right, that's not me!" and disappears before your eyes! Another well know haunting is that of Malcolm, he is a old man of ghost in this haunted cemetery. Malcolm he will tell you his name and how worried he is... , he appears to be in his late 70's in a dark suit and can hardly walk. He ask you kindly for help in leaving the cemetery telling you the car that dropped him off has left him. Many say he lingers near the front gate and sometimes waves. But always he will say, if you offer to take him to where there is help "I'd better wait someone soon will show up to collect me!" then that quick he is gone. 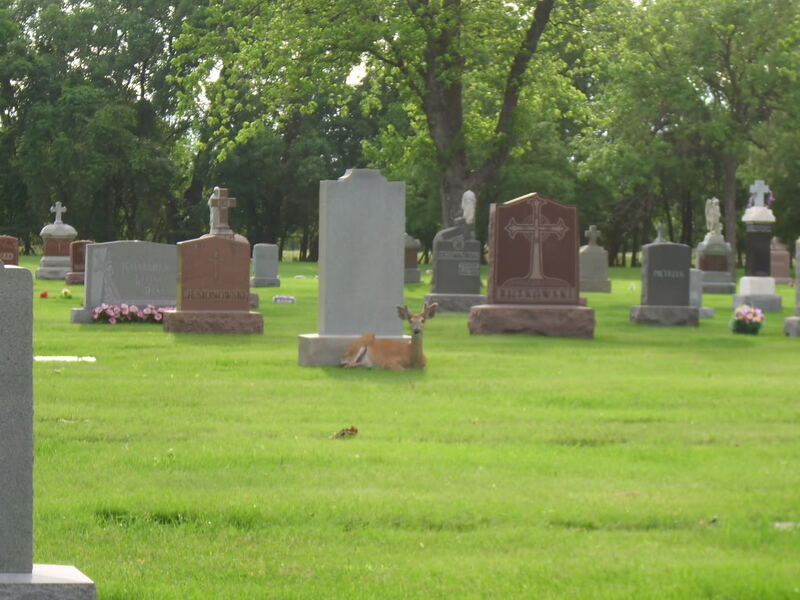 Visitors to the cemetery are advised to go there at their own risk. Awsome,Mara!!! Thanks for sharing this. butterflyburks wrote: Awsome,Mara!!! Thanks for sharing this. the story of Andrew is just horrible...sent chills up me spine! It's strange to have the deer in the pics. It seems to be so much at home. I love the stories - of ghosts, hauntings, etc.